Psalm 90:12 - Teach us to number our days aright,that we may gain a heart of wisdom. 1. How long does it take to register a domain name? 2. Can I register my own domain name? 3. Do I have to use your web hosting services if I want to register a domain name through mickwood.com? 4. What restrictions apply when registering a domain name? 5. How long can I register my domain name for? 6. What can I do if my preferred domain name has already been registered? 7. What happens if I want to change my registrar from mickwood.com to someone else? When your new domain name has been registered it can take up to 72 hours to propagate around the world although it is usually much quicker than this. During the propagation process your newly registered domain is being updated by the various Internet Service Providers around the world. Please note that mickwood.com has no control over this process. Yes you can. There are lots of companies willing to register your domain name and prices vary widely. If you intend to use mickwood.com web hosting services you will need to point your domain to our servers. Not at all. You will need to tell us the Domain Name Servers your website will resolve to. 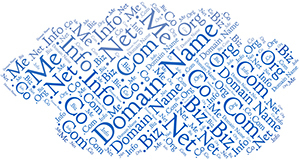 Domain names must be between 2 and 63 characters in length - one letter names are reserved. No spaces are allowed at any point and you cannot start or end a domain with a "-". Nearly all domains can be registered for between 1 and 10 years although only registering a domain for 1 year may well incur an additional £5 annual charge. Prices differ depending on the type of domain and the length of registration period. Check out our prices for a comparison and further information. There are over 300 million registered domain names worldwide and many of the most popular names have already been taken. Verisign estimated that 1.3 million domain names were registered in Q1, 2017. As a result you may have to be creative to obtain a good domain name although we can help you. This is known as an IPS Tag Transfer. If you wish to change your registrar there is a 'one-off' administration fee of £20 per domain.